Rishi often portrays unique trait that separates him from the crowd. In simpler terms, he is a person who does not lose hope even in the times of crises. He completed his BCA in computer sciences and then moved on to pursue his post-graduation in international business. This is where he first had an idea of revolutionizing the service industry in India through digitization. Ever since completing his studies, he had the entrepreneurial bug in him. He was part of various ventures like Apna Lucknow, and Footwears Infoline. He also researched & prepared a 630-page manual on Computer Security, entitled as ‘Extreme Hacking & Computer Security’. However, he came into limelight with his latest startup called VyaparHub. After several sessions of brainstorming, he along with others came to an idea of starting VyaparHub, first of its-kind & fastest growing, diversified digital (virtual) company start-up. 360′ Startup Business Design, Incubation, Growth Architecture, Funding Facilitation, etc. Health & Wellness Management Services. Before taking the plunge into entrepreneurship and starting our own show, we (the co-founders) did a thorough brain storming on how we can transform the entire Indian service industry into an even more effective & sustainable ecosystem through digitization. Since a long time, starting a new & sustainable business with less or no investment in hand, has been quite difficult in India. Understanding the vacuum of services to simplify the business generation (startups & emerging businesses), VyaparHub came into existence in 2012 as India’s first digital (online) startup mentoring, incubation, growth acceleration and funding assistance company. 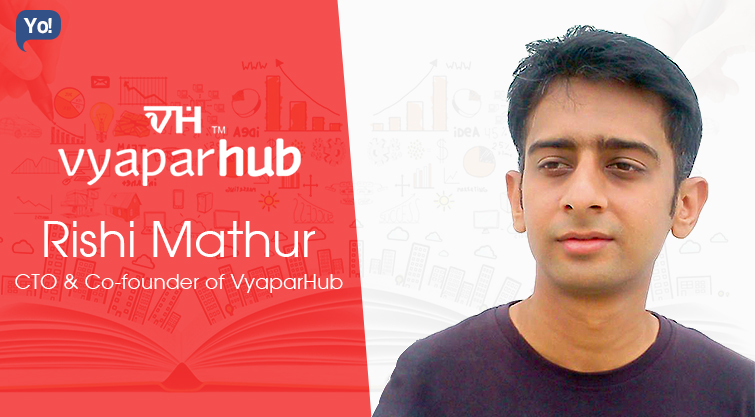 Vertical Name: VyaparHub Ventures: Domain: 360′ startup business design, growth acceleration and funding facilitation. Vertical name: Margdarshi: Domain: Marketing process outsourcing (MPO). Vertical name: Adhyayan: Domain: Education management services. Vertical name: Manan: Domain: Health & wellness management services. Vertical name: Samadhan: Domain: Strategic consulting & business advisory. VyaparHub is first of its company in India which provides such unique business services in a fully online/ digital format, making them really effective, result oriented, extremely affordable and highly accessible to everyone, empowering every individual and organization to become the growth driver in Nation’s economy. Never get your life’s aim faded by your bitter past or any kind of experience in bad taste. Consider it as motivation to shape your dreams and to prove yourself to everyone who thought can’t do it. No empires have been built without blood & sweat, and so is your dreams. Be mentally tough & physically rough. We received a lot of criticism and rejection on our concept in the initial phases in our direction in transforming Indian service sector ecosystem. Crisis in terms of funds and resources also were big challenges. But I am somewhere I am really thankful to all such situations that transformed me into a better & tough entrepreneur and our startup into a known, really successful & 100% profitable & proudly bootstrapped company. We learned from our challenges in a very spirited way, and improved our business model & other necessary areas from time to time. rapid innovation on 360′ level have been adopted as our success tool, which we practice without any second thought. We are a fully bootstrapped and 100% profitable company, with a growth rate of 200% YoY. At VyaparHub, we believe everyone who serves the company in a fully spirited way is the pillar of the company, no matter whether they play a small or big role. Equal attention is provided to everyone in a bilateral format and ensured that they enjoy financial and non-financial benefits to keep their interest & dedication intact. We provide time-to-time surprise incentives, offers/ opportunities, and bonuses in various forms to make them believe every effort they do for the growth of the company is being valued & appreciated. Further, we are also in process to bring in the stock system for our team members. For budding entrepreneurs, startups and existing organizations as well, entire social media is a huge untapped treasure. We market our services mostly on social media platforms like Facebook, Linkedin, Pinterest, etc. Additional to social media, we do print media promotions is specific cases. Designing & implementing innovative strategies is a important phase to build up your startup. Try as catch as much eyeballs as possible to get ahead of your competitors. I prefer to work late nights in addition to day based works. Working late nights (or overnights) helps me to better concentrate on my work, helps me to generate better ideas, solve problems and generate better results. Though I would not endorse my habit as it may effect your health adversely, but I have been practicing since a long time. I usually think on some particular issues more than required, which is quite stressful and unproductive. This is the first habit I wish to change in myself and I am working on it. Be ready to get your hands dirty & face any/ every challenge up to the extreme if you want to be successful. Never trust anyone blindly except your family. No one will come by your side in your bad time other than your family. Use each & every second of your life to get closer to your dreams no matter what the situation is, because if you won’t, someone else will do & get ahead of you. Becoming the largest business service provider in India especially for startups, emerging businesses and SMEs/ SMBs in entire India & Asia Pacific. Transform entire business ecosystem in India thru our affordable & innovative digital services. Creating 500 Franchisees / Business Associates pan-India. Multiplying the employment opportunities on various levels. I am quite happy and feel lucky on being an entrepreneur, and if I get a chance to start my career again, I would happily chose to be an entrepreneur and try my best to shape my dreams even more effectively & sincerely.